On this tour we will start the day driving south in NJ where we will stop by Washington Rock Park. This is one of the oldest parks in New Jersey. This park is famous for a scenic overlook which was taken advantage of by General George Washington during the revolutionary war. From a vantage point of a natural rock outcropping, General Washington monitored the British troop’s movements and instruct his continental army to act accordingly. Next we will stay in the time frame of the Revolutionary War by visiting Rockingham House. This was the home of John Berrien I and George Washington's final headquarters in 1783 during the Revolutionary War. Receive a guided tour of the house which maintains a fine collection of 18th-century furnishings and Washington military reproductions, a children's museum, and a Colonial kitchen garden. Last we will enjoy some Canoeing / Kayaking or the historic Delaware and Raritan Canal (D&R Canal). The D&R Canal was built in the 1830’s to transport goods and materials between New York and Pennsylvania. Today, the canal is used primarily for water supply and recreation. You will have two hours to enjoy on the canal. The canal has very calm water (no rapids) and we will paddle out and back, so you decide yourself how easy or hard you want to make it. The price for the tour includes a shared canoe either with a partner that you book the tour with or we will pair you with another tour participant. 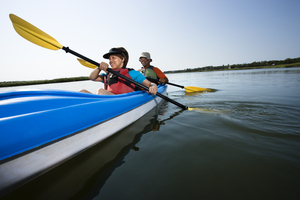 You can also choose to pay an additional $10 for a single kayak. On the canal you will have great opportunities to view various wildlife. Arrival back to NYC at approximately 5 pm. CASH: Although our tour is classified as an "all inclusive". It is advisable to bring some cash for gratuities for the guide which is left to your discretion.